You work with a modeling workbench in your projects and you don’t know how to communicate your work? You have to fulfil many processes in your company that require the production of many documents? 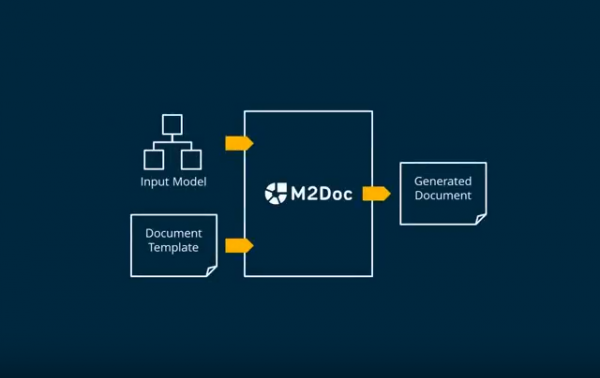 Discover M2Doc, the open source solution to automate the production of Word files from your models. M2Doc gets now its own dedicated website, feel free to visit it. If you are interested, contact us to see a demonstration about M2Doc adapted to your specific context! M2Doc 1.0 was unveiled for the very first time the 26th of October at EclipseCon Europe 2017. If you missed it, you will have a second chance to see it at SiriusCon 2017, the free international conference on graphical modeling, on November 9th in Paris.